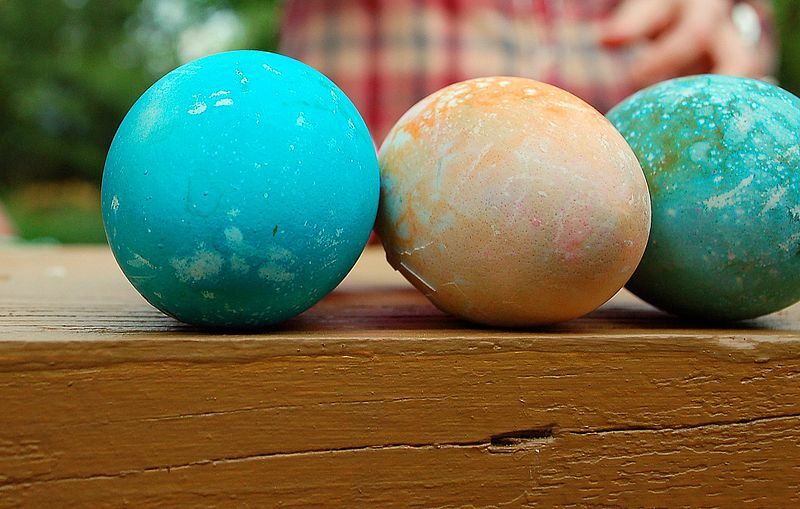 When you hard boil your Easter Eggs, add a little vinegar and one (or more) of these natural dyes. After you’ve boiled the eggs in the dye for about 8-10 minutes, the colors will be beautiful! Rub a little vegetable oil into the eggs for a shiny coat afterward. Send us your photos of your Easter Eggs! Soak a whole bunch of onion skins in a big bowl of water. Try to keep them as big as possible and not ripped. Dampen squares of cloth. Any rag will do as long as each egg has its own cloth pocket. Wrap onion skins around the eggs, covering the entire shell. The water will help the skins stick to the egg. Wrap a cloth around each egg and tie it securely with a rubber band. Carefully place the bundled up eggs into a pot of boiling salt water. Let them boil them for 7 or 8 minutes and then remove them and pour cold water over them. Once the cloths are cool enough to handle, remove the rubber bands and take the eggs out of the cloths. Peel off the onion skins and there you have it! Wipe the eggs dry and rub with a little vegetable oil to make them a little shiny. If you want a design on your eggs like in our photo, draw on the egg with a wax pencil or a thin crayon before wrapping with the onion skins. The area you draw on will not absorb any dye and will appear white after you’ve finished. 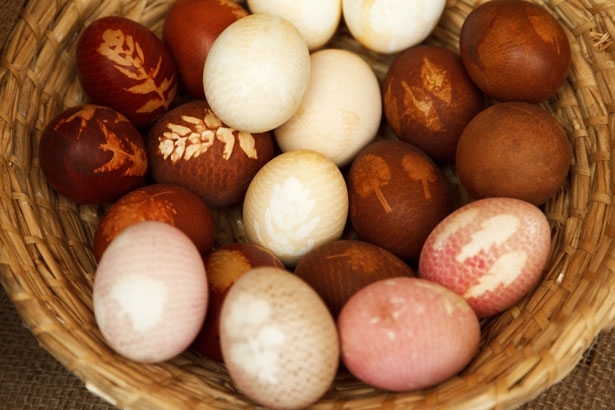 Send us your photos of your onion skin Easter Eggs!